Anyone can make a ham sandwich-right? The trick, when you are following the WeightWatchers plan-whether you are counting propoints or having a Filling & Healthy day, is to really exploit the ingredients you can eat freely. 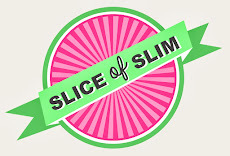 Regular readers of Slice-of-Slim will know that I really like to push this plan to its limits and use ingredients in ways you might not think of! So…to save having to use any propoints for low fat spread or mayo, I tried using 0% Fat yoghurt in my sandwich and it was absolutely delicious! I spread a couple of teaspoons on one side of the toasted pitta bread, and some Dijon mustard on the other side-fantastic! I've added the weights if you are counting propoints, in which case one toasted filled pitta comes to 5pp/approx.240kcal. (If on Filling & Healthy or Simple Start, use ingredients freely). Simply toast the pitta bread until crisp on the outside. Carefully cut open and spread one side with yoghurt and the other with Dijon mustard. Load full of wafer thin ham and copious slices of crunchy cucumber. A grind of black pepper and you're ready to go! You could be chomping through this within 5 minutes of walking in the door. You can really make the yoghurt tasty by adding lemon zest, chopped herbs (chives or parsley are great in this sandwich), or a little chilli powder or paprika to liven things up a bit-have fun and experiment.